WHAT BETTER way to work your quadricep and hamstring muscles than a good cycling workout? Even better in the company of good friends. Yesterday, my fellow OT friends and myself (I love this group really, we have OTs in acute hospital, community, mental health and paediatrics practices) met up for a leisurely cycle. The haze situation in Singapore was not against us, we were blessed with clear weather that Saturday. 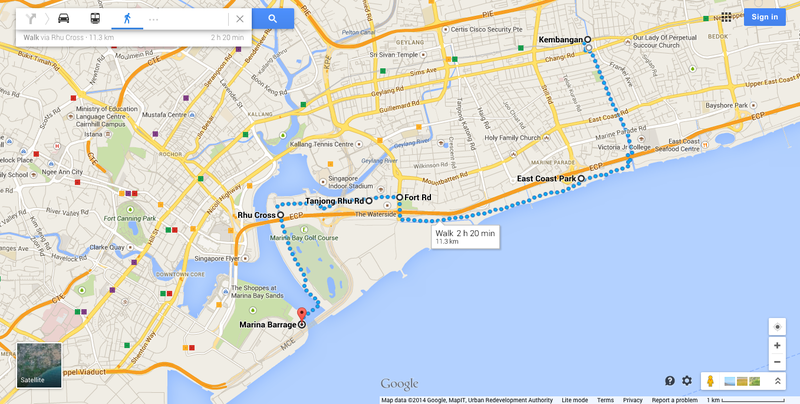 We started at Telok Kurau just 10 minutes’ walk away from Kembangan MRT where my friend stays. We took on the Eastern Coastal Loop which essentially puts together all the park connectors in Eastern Singapore. Click here for a map of the Eastern Coastal Loop. I love the park connectors, as it is relatively easy to cycle on these straight paths. The canals alongside where we cycle make the route quite scenic as well. So off we went down the Siglap Park Connector and into East Coast Park (ECP). We cycled to the West end of ECP and our adventure began. For you see, there were a lot of construction works going on at the junction of Fort Road and we blindly followed a group of cyclists down a set of dirt tracks. We ended up at a sandy lot next to the Marina Bay Golf Course, and had to have these strangers help us with our bikes across a construction site. Bless these strangers and their strong lifting arms! Once we cleared the construction site, we ended up at Gardens by the Bay East. Aboslutely lovely stretch of 2km here, as the place was almost tranquil. I guess it was also because most public would visit the Central or Southern ends of the Bay. We were surrounded by lush greenery and enjoyed overlooking the dragon boating activity that was ongoing in the marina. From there, we cycled into Marina Barrage and took a well-deserved break. Toileting facilities made it convenient for use to refill our water bottles and meet resting needs. We were abit more careful on the return trip back. Instead of crossing the construction site (which on hindsight was pretty dangerous! ), we went into Tanjong Rhu area and cycled along the waterfront condominiums en route to ECP. The route is approximately 10km, which puts us to having had cycled 20km in totality that day! What an accomplishment! It took us about 3 hours, including a 30min rest break at Marina Barrage and a separate 20min ice-cream date at Ice Cream Chefs @ East Coast Road. Looking forward to more of such trips, probably trying out the North Eastern Riverine Loop next! It’s a lovely experience finding out more of such Singapore, aside from the busy city life we are all used to.